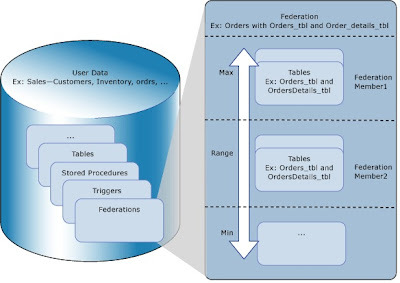 Federation is a database object like other objects such as tables, views, stored procedures or triggers. It is also known as Sharding. There can be multiple federations in a database. It is data dependent/data directed routing so it can scale out across databases. It is a feature that you can only do on Azure; it is not supported in regular SQL Server. Ø Scale out when you need and scale back when you don’t need. Ø Create an elastic database tier that can expand and contract with your applications workload Ø without downtime! Ø Federations offer scale beyond the capacity limits of a single SQL Azure database. Ø It can horizontally scale out to many nodes. Ø It can go beyond the limits of a single Azure database. Ø It is favorable for very small tenants and very large tenants. Ø Tenant management is very easy with federation. Ø Tenant placement can be changed at any time without downtime. Ø Federation allows online repartitioning of data through ALTER FEDERATION T-SQL commands. Ø By repartitioning SPLIT operation data can be moved to new federation members without downtime. Federation & NoSQL - Federation and NOSQL are different. It uses SQL within each federation member. It supports Parallel Queries and Map Reduce patterns same as what NoSQL offers. Federation & Partition - Federation and partition are similar but there exist a difference. In partitioning SQL Server gives us an automatic way to query all the partition. In federation there is no automatic way; Federation members don’t talk to each other. Just take an example. Divide a big table into 2 tables and keeps them into a single database and query them separately that is really a federation. It means 2 tables look like to be in separated databases and they don’t talk to each other. You can’t do the join between 2 tables too. Federation Root: It is a database that contains the federation database object. It stores federation metadata information. All application connects to federation root first. Root database is the central repository for information about distribution of scaled-out data. Federation Member: Federation use system managed SQL Azure databases to achieve scale-out named federation members. Federation members provide the computational and storage capacity for parts of the federations workload and data. Collection of all federation members in a federation represents the collection of all data in the federation. Federation members are managed dynamically as data is repartitioned. Administrators decide how many federation members are used at any point in time using federation repartitioning operations. Each federation member is a single database. The CREATE FEDERATION process creates a new database based on the root database. When you create a new federation you have to give the name of the federation (not the name of the physical database, which is a System-GUID), the name for the distribution key, and distribution data type on which data will be federated on. The valid distribution data types are int, bigint, uniqueidentifier and varbinary (up to 900 bytes).Varbinary can be used if you want to define string or characters federation. You need to cast string to varbinary and then you can create a string federated member. Currently only Range Distribution Type is supported. Probably in next future release we expect Azure should support HASH Distribution Type also. SalesDB is the root database with many federations. A distribution type to specify the method for distributing the data such as ‘range’. Federation Atomic Unit: All data for a value of a federation key stored in the same federation member. It represents all data that belongs to a single instance of a federation key. Federation design is de-normalized rather than usual normalized design. 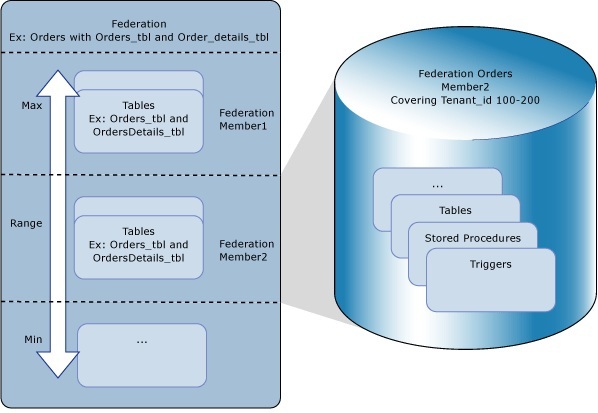 Entity/Federated Table: Refer to tables that contain data that is distributed by the federation. Tables that will be split based on the federation and their federation columns. Ø It is subset in each federation member. Ø Must Use Entity Key FEDERATED ON CLAUSE. Ø Federated by entity key – must be part of a primary key. Reference table: Refer to tables that contain reference information to optimize lookup queries in federations. Reference tables are created in federation members and do not contain any FEDERATED ON annotation. Ø Tables that will not be split, but should be referred by the federated table. Ø These tables will be copied across all federation members. Ø Exist in each federation member in entity. Example would be a Product table or other dimension tables. Important Note -When you do a split of a federation member than reference table will be replicated automatically to new federation member. If you want to insert/update reference table than you have to do it individually for each reference table in each federation member. There is no way to keep reference table in sync automatically. Global Central Table: Refer to tables that are created in the federation root for typically low traffic or heavily cached data that does not need to be scaled-out. Ø Tables that will not be split, and very rarely join-select with the tables in federation members. Ø Exist in federation root – Good for storing metadata. Cross-database joins are not supported in SQL Azure and it is a typical behavior of SQL Azure. SQL Azure federations don’t support Identity on a column while creating new table. If you shard your data into N number of federation members and then decide you need to make a schema change, you’ll have to modify the schema on each federation member database. There should be a primary key on a table of a source database if you want to do migration to SQL Azure federation. First Backup the federation member database somewhere on SQL Azure. Now drop the federation member. Now insert backup data into specific range. Sync Services of SQL Azure is not supported. Azure import-export is also not supported. SQL Server 2012 data tools (SSDT) is also not supported. Joins, grouping, aggregation should be done by application and to do the same fan out queries can be used. There is no automatic fan out query is currently supported in Azure. sys.federations represent the federations in a database. sys.federation_distributions represent the definition of the federation distribution scheme for federations. sys.federation_members represent members of the federations. sys.federation_member_distributions provides the distribution details per federation distribution key per member. sys.dm_federation_operations returns one row per SPLIT or DROP operation on a federation. Each row contains information on the progress and any error conditions for the operation. sys.dm_federation_operation_errors returns rows containing information on errors that occur during SPLIT or DROP federation operations. sys.dm_federation_operation_error_members returns the list of members involved in federation operations that failed due to errors. Connect to SQL Azure database through SSMS. Above statement will create a federation root database. Now connect to FedDB again using SSMS. You can’t switch to FedDB directly so you need to connect again. assume that we also have a CustomerAddress table and it has a CustomerKey as a part of primary key. related with CustomerKey, in this case product table will be created as a reference table. with data type int and distribution type is range. Assume you have data loaded into Customer and CustomerAddress table by using some insert script. doesn’t support linking databases as it happens in the SQL Azure Gateway. 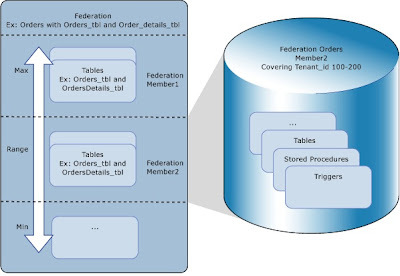 federated tables, this is one of the beauty of federation and good example of atomic unit. My sincere thanks to Bob Beauchemin, Cihan Biyikoglu, George Huey and msdn. It is supported, but it will require you to use SQL Always ON Availability sets if you want to replicate VMM too.